Get kitted out for this summer and, at the same time, help support research into a currently incurable disease! We have chosen the best available Italian fabrics specifically for cyclists at the HIGHEST LEVEL. Made of 4 different fabrics: windproof for the front, lightweight and breathable back panel, stretchable sides and slight compression material for the shoulders and sleeves. Close-fitting race cut, a drop-down "magpie" tail provides optimal comfort for the lower back even when in the drops, the sleeves are slightly longer than usual (as preferred by the pros) and our laser-cut finish for a seamless hem. 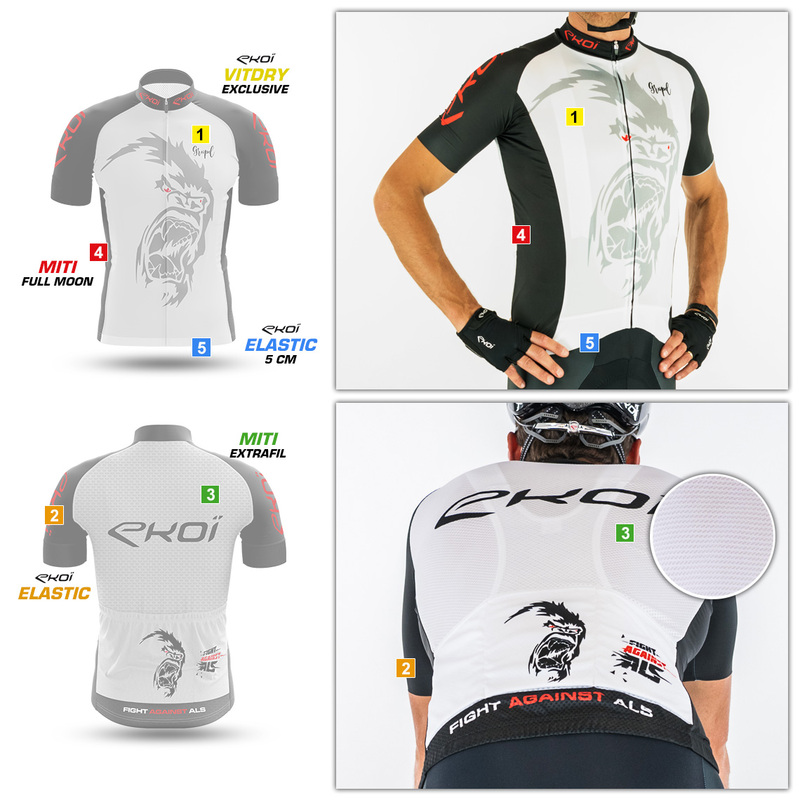 We have spent a long time in the design of this jersey to give it the best possible finish so that you can ride in optimal conditions and look stylish too. - Material made in Italy. - Laser cut sleeve ends. - Absorbs moisture to rapidly wick it away to the exterior surface to leave the skin dry. - Ladderproof material, laser-cut sleeve ends. - its aerated structure is perfect for optimal wicking. - extremely breathable and ventilated. - YKK (for its reliability) self-locking full front zip. - Bottom zip garage to prevent zip rub against the bib short. - 5cm-wide front waist hem. - Bevelled cut for optimal comfort. - Silicone band back and sides waist hem for support of the lower back.